This is a common and well known occurrence in the use of almost all forms of digital signaling. As applied to computer and telecommunications, it is typically dismissed as unimportant since a data packet is still a data packet, even if it does arrive at different times, and so applying the concept of buffering usually addresses any untoward issues that might arise from the delay caused. However, jitter is also a factor that has to be taken into account in the field of Hi-End consumer audio. Today, with more and more of our listening sources moving onto the digital medium, understanding the technology advancements and pitfalls of an all digital system becomes a necessary evil. So what is it actually? Jitter can be simply (but not accurately) defined in plain-speak as ‘ the timing (temporal) difference (variance) that occurs in the transportation of a digital signal from a clocked source. ’ For the topic as addressed to Hi-Fi, this is more than sufficient. It takes an in-depth understanding of the mechanisms of today’s digital Audio medium to truly describe the complex fundamentals of jitter creation; far more that the scope of this article, but the basics are not difficult to understand. Jitter is an induced effect. It is not ‘naturally’ occurring like sunlight.. Jitter is mainly caused by the various mediums a digital signal is forced to traverse: metal, glass, plastic – all of which serves to change the signal is some subtle way. A particular material may the retarding effect like water has on light – bending/refracting it. A combination of such materials in succession serve to create a significant ‘slow-down’ effect on a digital signal, and enough of them add up to make this effect actually measurable. So what happens then? This may occur with any electrical device or signal, but it is with DIGITAL information that the effect is most pronounced. Electrical analogue signals are accepted at the delivery end in their simple imprecise waveforms. Part of the beauty of an analogue signal is its fuzzy character. A digital signal can have but 2 states – ON and OFF, any misrepresentation and a wrong state could be the result. That is not all. In digital music, in order to ‘simulate’ the natural analogue harmonics, a sample of the analogue signal is taken at regular intervals. This is the all famous ‘sampling rate’ and it is measurde in kilo-Hertz (kHz). A standard CD sampling rate of 44.1 khz simply means that 44 thousand samples are taken over the duration of one second. (Side note: if you actually think about it, the highest frequency wave-form that CDs can store is half the sampling frequency (~22kHz), which is slightly greater than the highest frequency that human ears can hear (20kHz). But, we the audionuts can't be happy with a square-wave to represent 20kHz wave-forms! That is why SACD and DVD-A are addressing this issue now) If you were to put all these samples together, you would get a like representation of the waveform it was sampled from, albeit an imperfect one. And that is how we listen to digital music. Jitter delay can mess up that already imperfect representation. When too much of the digital information gets messed up or lost because of jitter, the receiving DAC has to work a lot harder to extrapolate the missing information and relying on algorithms to recreate the sample. Jitter can be measured with sophisticated oscilloscopes and then the value computed in picoseconds (ps). The higher the ps value, the worse the jitter caused by that particular medium. Some examples of measurable jitter from different digital interconnects used in Hi-Fi : Optical (plastic) cable – 2944 ps, Electrical (co-axial) cable – 1434 ps. * taken from Monarchy Audio’s site * As you can see, the difference between two standards of digital transmission and the medium used can cause as much as a 50% difference in jitter. 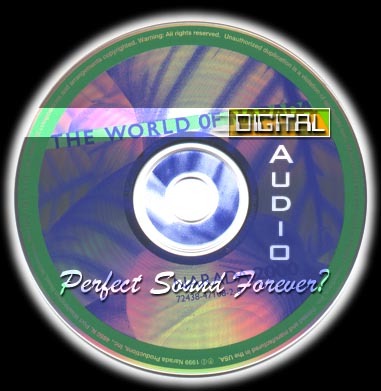 In Hi-Fi, little can be done to address the jitter inherent in the design of all complete digital sources. Whatever steps the manufacturers have taken to minimize this problem count for more than what we could ever do from the comfort of our homes. Often the idea of ‘reclocking’ a CD player may sound appealing but it does nothing to reduce the jitter already present by the circuits on the motherboard. This ‘no-go’ approach is best applied for one-box digital sources. In the two-box (or more) setup, whereby the digital source and analogue output stages are two separate entities, some careful consideration on the path the signal has to travel may yield significant results. The main culprit of EXTRA jitter is the cable used between the CD source and the DAC. As shown earlier, the difference between Optical and Coax is quite a lot. There is a caveat to this : if you are planning to use LONG runs of cable, an optical cable will actually create LESS jitter because coax cables pick up more Electromagnetic Interference (EMI) the longer they are, unless properly shielded. Yet another alternative to buying an extremely expensive and lengthy optical cable, is to use a JitterBug; aka jitter-buster. Devices that reduce jitter are known as JitterBugs. Some fancy sounding names from manufacturers include : Digital Interface Processor (Monarchy), Digital Transmission Interface (Audio Alchemy) and Timebase Linque Conditioner (Theta Digital). The main idea behind such a device is to ‘recondition’ the digital signal just before it enters the DAC, with the aim of restoring and retiming some of the digital samples by reclocking it again with onboard processors. This way, your digital feed goes through 2 processors: one at the source for pickup encoding and another at the JitterBug (which takes out the jitter the signal picked up, encodes it again and sents it out – hopefully in a better condition than it was received in) before the your DAC even starts to sample the waveform for analogue conversion. But does having less jitter make your music sound better? Now, according to the laws of mathematics that govern our existence, it should work; and admirably so. But again, of all the voodoo magic in this world, Hi-Fi must be one of the most potent….. and subjective. Alas, it is not the aim of this article to disparage the facts or to query the emotions involved. A) That jitter can cause unrecoverable damage to a digital signal if left compounded –Yes. B) That different mediums (and circuitry) can alter the amount of jitter created – Yes. C) That the use of JitterBug can reduce the amount of jitter in the signal – Yes (according to their manufacturers). Yet there are still audiophiles who believe in the power pure analogue LPs and shun CDs like the plague. A purely digital domain : Necropolis or Nirvana?